Last night I had the pleasure of attending the 6th annual NY Wine Expo, a wonderful three-day show for both trade and consumers. Besides the usual suspects this year featured some unusual wines from Bulgaria, Lebanon and Turkey as well as some exciting seminars including an Italian wine and cheese tutorial led by Lou Dipalo of DiPalo Imports. Planning my tasting strategy I was happy to spy an old friend among the ocean of wine flowing freely in the crowed hall full of wine enthusiasts, Vinkara Winery from Turkey. 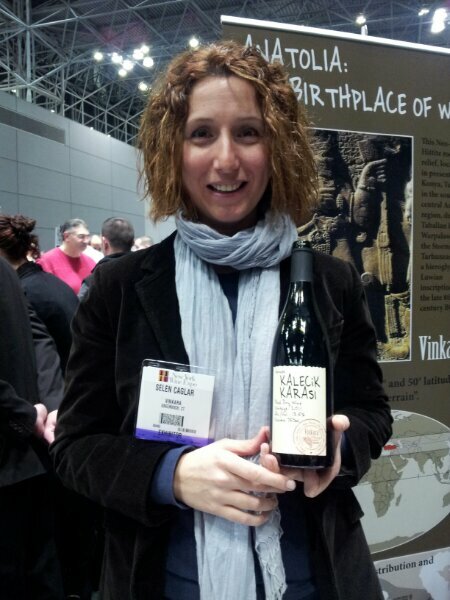 I first tasted Vinkara’s Kalecik Karasi (KK for short) two years ago at a wine bloggers BYOB night in Brescia, Italy. It was the first Turkish wine I had ever sampled but I was impressed with its quality and story behind its origin. Interestingly, Anatolia, where Vinkara is located, is thought to be the original source of wine grapes, evidence of stone age vintners squashing grapes date back to 6000 BC. Last year at the EWBC held in Izmir, Turkey I tasted the entire range of Vinkara’s wines and liked them so much I lugged a few half way around the world as they were not available in the US. Recently, Vinkara’s wines have been launched in Connecticut and NY with great success. The unusual grape varieties featured by Vinkara include Narince, Emir, Bogazkere, Öküzgözü and their flagship red wine, Kalecik Karasi. My favorite, Vinkara’s KK, is delicious! KK’s soft tannins, medium acidity, aromas and flavors of juicy blackberry, vanilla bean and red ripe cherries make it a great wine to sip on any occasion, with or without food. Although I wouldn’t mind making the trip back to Turkey to source more I’m glad its made its way into the vast selection of interesting wines available in NYC. Look for it soon at your favorite wine shop. Imported by Fine Terroir Selections. I recently took a trip to Turkey and fell in love with their wines as well! I’d love to be in contact with you with an eye to widening exposure and availability of Turkish wines in the States. Here’s a link to my recent blog post about my trip there (mostly focused on a visit to Kavaklidere.) Cheers! Thanks for your comment. Last year I traveled to Turkey for the EWBC conference and toured Cappadocia to visit their great wineries. See my post on Cappadocia for info on these. Sad all of the problems now facing the wine industry in Turkey. Hopefully we will see more of these wines in the states!